The day was spent with Richard making boxing to cover the Finrads on both sides of the saloon. The purpose of the boxing is to conceal the finrads (low level linear radiators) and the plumbing pipes just above floor level. Richard’s method is to horizontally screw a 20x20mm pine batten to the interior ply lining at the planned height of the boxing. 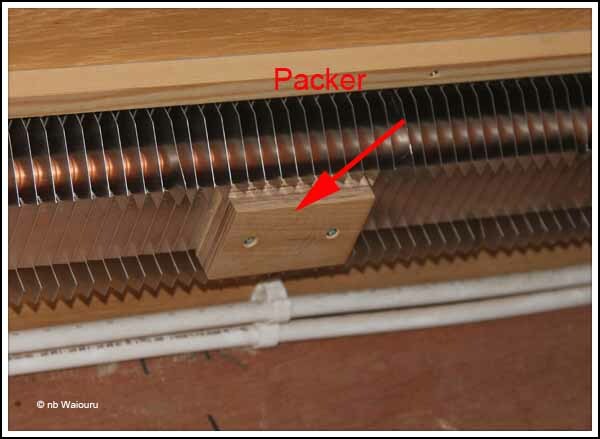 Next pieces of ply are screwed to the face of the finrads to act as a packer (spacer). 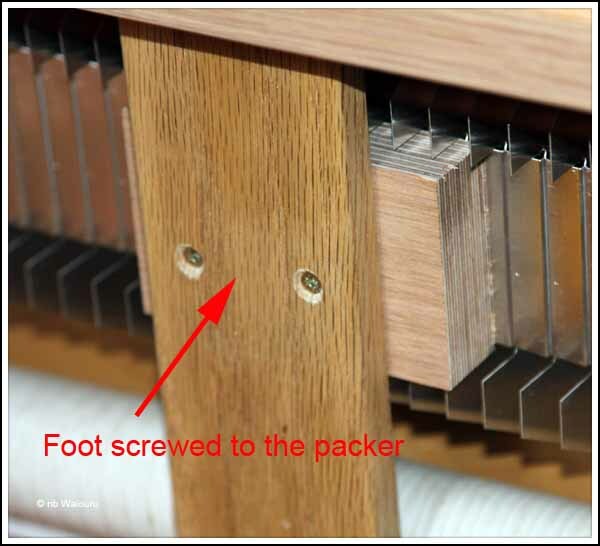 Then a vertical piece of oak is screwed to the packer to act as a foot for the boxing top plate. 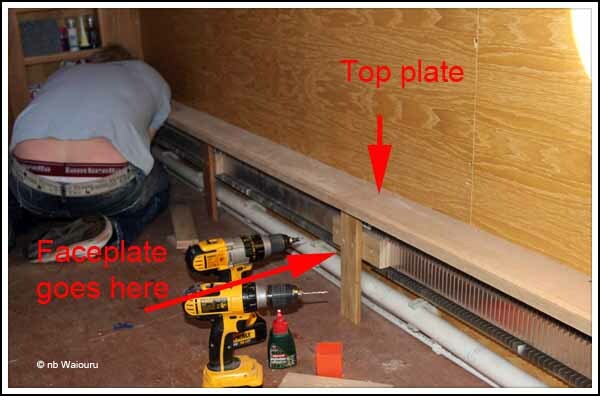 A horizontal length of oak ply is also screwed to face of the finrads using the oak ‘feet’. This conceals the finrads and the piping. A gap is left between the faceplate and top plate. Another gap is left between the bottom edge of the faceplate and the floor. The two linear gaps allow cool air to rise up behind the faceplate where it is heated by the finrads. The warm air can then escape through the upper gap. Richard made a mistake and was sent to the corner in disgrace. The top plate is screwed to the on one side and rests on the top of the ‘leg’ on the other. In order to get a tight fit against the wall Richard scribed the edge and then cut it to exactly match the deviations in the curve of the wall. Once the boxing had been made and fitted to both side of the saloon it was dismantled and taken back to the workshop for a final sanding and a first coat of satin varnish. The plan is to reinstall it tomorrow. 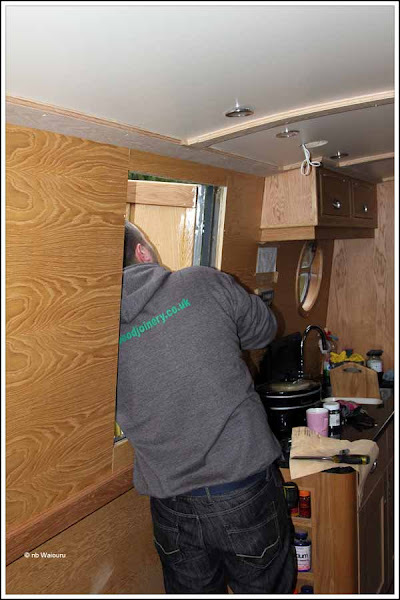 There was just enough time left for Richard to commence cutting out the timber for the side hatch interior doors. These will be glazed. Meanwhile Darren has been painting the cratch board. He has completed the undercoat and a first top coat. Jan has decided the final colour will be graphite. Darren also gave the King plank another coat of gloss varnish. The board is starting to look very nice. 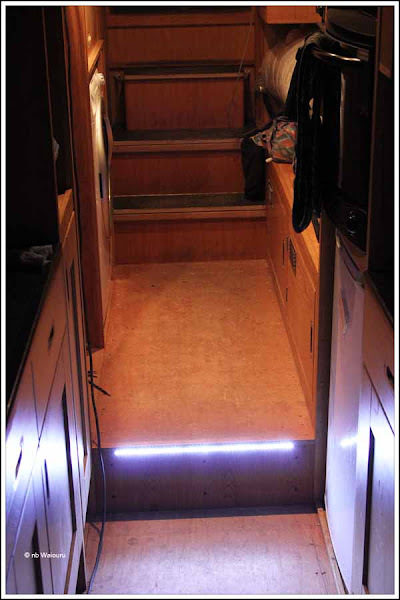 One of my last tasks for the day was to wire another LED strip light. This one is across the top of the face of the step between the galley and the back cabin (the step up onto the blackwater tank). We have recognised the step is a potential hazard (trip/fall) for anyone not familiar with Waiouru’s layout. 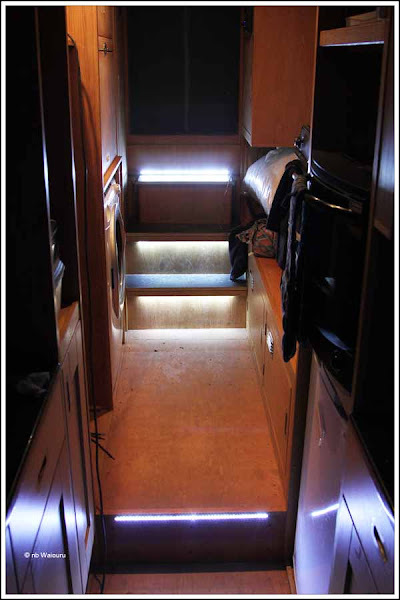 It’s configured to illuminate when the main back cabin lights are turned on. At approximated £1.60 per LED it seems good value. Geoff (nb Seyella) left a comment on yesterday’s post regarding Waiouru’s draft. At 36 inches we would likely collect rubbish around the propeller at bridge holes and might have difficulty finding a mooring. 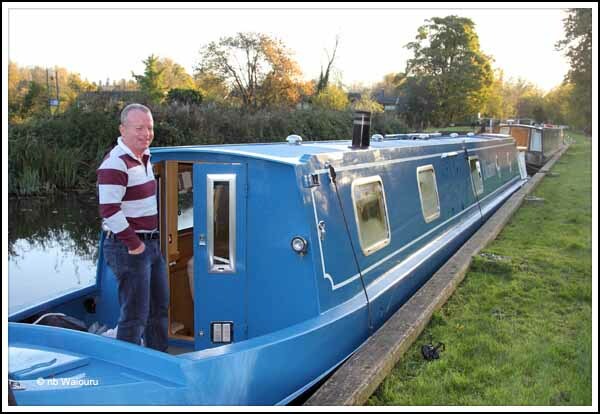 I’d already been doing some on-line research regarding the best draft for a modern narrowboat and Geoff’s comments confirmed what I’d read. First thing this morning I asked Richard if he would use his oscillating electric blade saw to cut out the floor isle in the galley. We then removed the underfloor Kingspan insulation panels to reveal the bilge. From the stern (rear) of Waiouru we have the diesel tanks, then the engine compartment, followed by the back cabin with the blackwater tank under the cabin floor. 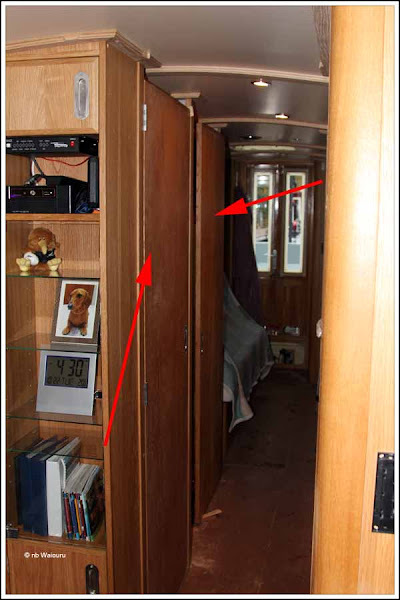 Next is the galley which is the nearest accessible area in the bilge to install ballast. Prior to installing the floor three rows concrete slabs were laid under the galley. Each row consists of three 2’x2’ slabs. In order to lighten Waiouru’s stern all, or some of these would need to be removed. The three central slabs were relatively easy to break up with a club (lump) hammer and remove. 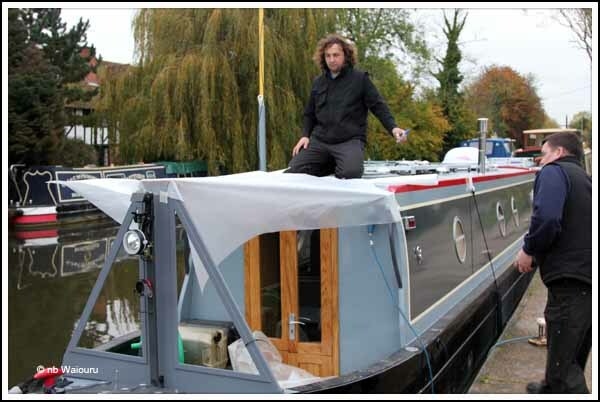 However in doing this I discovered the bilge had about 1½” of water washing around. This is probably water from the time when the water pump hoses weren’t connected whilst the tank was being filled. After removing the three slabs the stern rose slightly which was encouraging. The majority of the water in the bilge was then removed with a wet vacuum cleaner before making a start on removing the other slabs. Removing the water wasn’t essential but it splashed everywhere when I hit the slabs with the hammer. The remaining slabs were more difficult to remove as access was very restricted. The method I adopted was to lift the leading edge of the slab with a pinch bar and then slide a length of 15x40mm piece of oak partially under it. This broke the friction seal between the base of the slab and the felt in the baseplate. It was then possible to carefully pull the slab towards the centre of the boat and break it up with the hammer. All nine slabs were removed which has raised Waiouru’s stern by 6-7 inches. The draft is now 28-29 inches rather than 35. 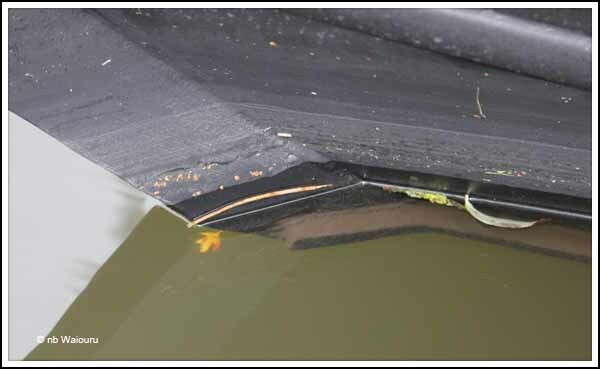 The tip of the top of the rudder is now also above the surface of the canal. One other positive consequence from the removal of the slabs is the rear hatch no longer attempts the decapitate you when exiting the back cabin. Meanwhile Richard had been making the Houdini surrounds from oak and also made a start on the trim for the finrads in the saloon. There was just enough time for me to assist him give everything a coat of Impreg before the workshop closed for the day. Tomorrow I’ll give the Houdini surrounds their first coat of varnish and then assist Richard to fit the finrad boxing. Hopefully Nick will be in the engine compartment installing the Sterling PDAR. We woke early late (daylight saving) and I then multi-tasked by eating porridge whilst speaking to dear old mum back in Australia. After that it was time to don the walking gear for a round trip to Calcot (Sainsbury’s) for some essential supplies (approx 10 miles). Somehow I never seem to be able to confine my physical shopping to Jan’s list and consequentially the day pack (rucksack) felt rather heavy on the way back to Waiouru. That Greek fellow (arthritis) is also giving me a little grief. Might be something to do with the weather. However I did enjoy the walk along the towpath admiring all the brown and gold autumn colours and the path strewn with leaves. Many of the moored boats had their solid fuel stoves going as one could see smoke drifting from chimneys. Back at the boat it was time for a quick shower. This served three purposes. Jan had already baked a loaf of bread in the slow cooker. Nothing like a tomato sandwich made with fresh bread! We have been working towards a situation where the blackwater (toilet) tank would be almost full and the potable (fresh) water tank empty. 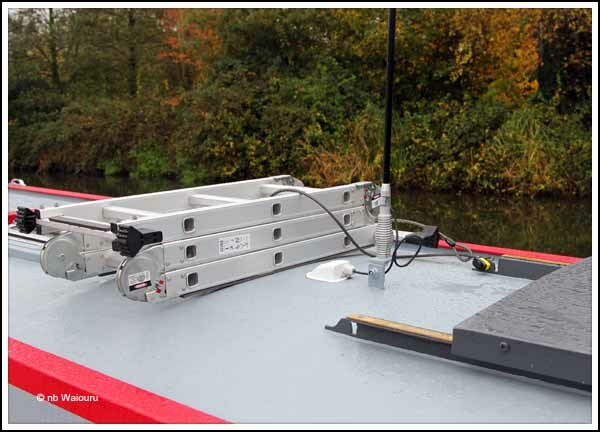 This would enable us to check the fore and aft (front and rear) trim of the boat. I’d previously measured Waiouru’s hull in the paint tent. 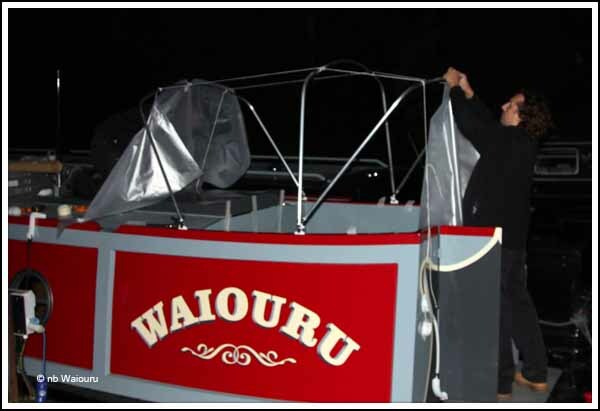 This enabled me to calculate Waiouru’s draft (the amount of the hull submerged in the canal. With the blackwater tank at the stern full and the water tank in the bow empty the stern was well down. 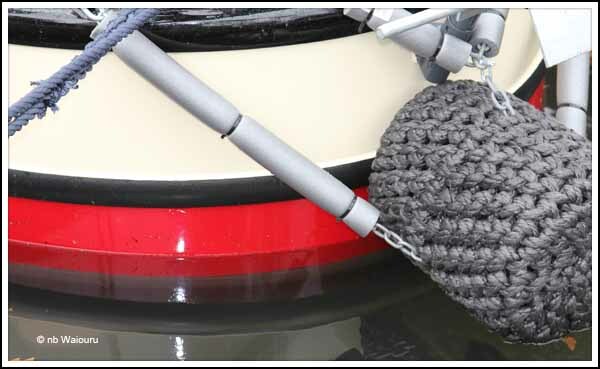 The button (stern fender) is just touching the water which is also 2 inches into the red tunnel band. I measured the draft at the stern an Waiouru is drawing 35 inches. This appears too much! Meanwhile at the other end……..
Another couple of inches and the bow will be out of the water. The situation improved after emptying the blackwater tank and filling the water tank. But Waiouru is still drawing too much water at the stern. 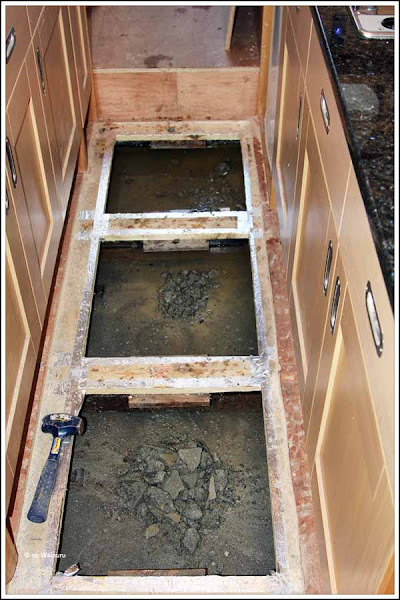 Prior to the floor being laid Andy had the last three bays in the boat ballasted with three concrete slabs in each bay. I think we will need to cut access holes in the galley floor and removed at least 6 concrete slabs. Somehow I don’t think extra cutting is going to please Richard and James. But it will probably be me who breaks up and removes the slabs! Jan and I got spliced almost 41 years ago. Haven’t regretted it and wake up most mornings thinking how lucky she was to be the chosen one! Recently she accepted an offer from another man to go off with him. He had something that I no longer have….. libido….. a car! However it can’t have been that great because Bill brought her back! Jan obviously knows when she’s onto a good thing! Anyway I digress! Today was about getting spliced for the second time in my life. Years ago I was taught how to whip rope, but until today I’ve never spliced it. Like 123,832 people before me I watched the instructions on YouTube. The actual technique is quite simple so I only had to pull it apart twice before it was done correctly (LOL). The rope 14mm 3 strand cordage came as a 20 metre length and we wanted two 10 metres mooring lines with a loop at one end and the other end back spliced. My “village idiot” technique was to wrap a piece of different coloured insulation tape around each of the three strands so I could tell them apart. This was 95% successful as I only went wrong twice. I even melted the ends with a naked flame to prevent them fraying before reading it was a bad move. Apparently the hard melted ends have the potential to tear open the palm of your hand if the cordage was to race through it. Consequentially I cut the melted ends off! 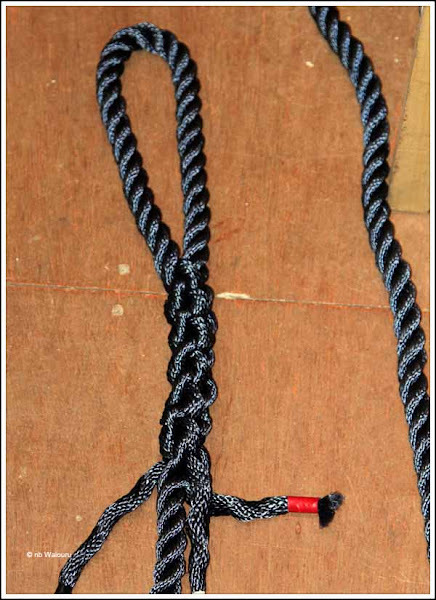 We now have two relatively heavy mooring lines to replace the 12mm cordage previously purchased on eBay. The latter will now be used as centrelines. 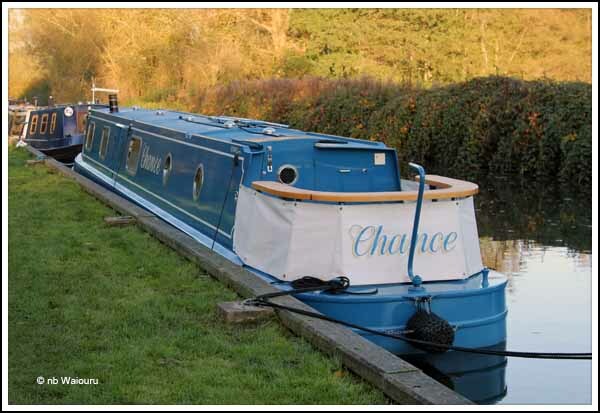 We had a chance encounter this morning (pun intended) after reading on the blog of nb Chance that James and Doug had passed us yesterday and were now moored at Woolhampton. The morning was cool and crisp so I donned my jacket, hand knitted beanie and mittens (made by Jan) and briskly walked the towpath to Woolhampton where I found Chance moored on the visitor moorings above the lock. Doug was up and about so I took the opportunity to snap a photo whilst James was finishing in the shower. We spent an hour catching up with each others news and learned of their winter plans before heading back to Waiouru. Hopefully we will see more of them in the coming months. The afternoon was spent preparing and varnishing the cratch king plank and applying a coat of ‘Impreg’ to the blackwater tank step face. Tomorrow the king plank will get a second coat of varnish and we will also look at fitting the door stops to the outside of the side hatch doors. 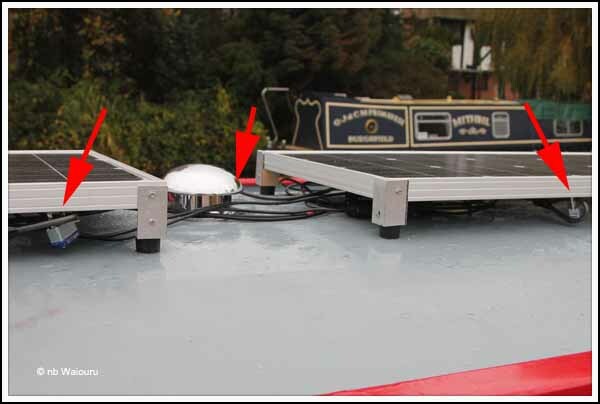 The stops will prevent the hatch doors from banging against the new paintwork on the sides of the cabin. 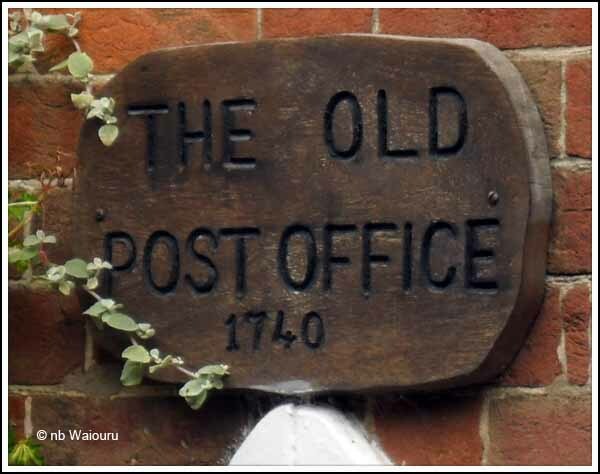 Preamble….. Yesterday’s spelling and grammar was atrocious! It’s all Jan’s fault….. she didn’t proof read it! We had been expecting Kinver Canopies all yesterday afternoon. Scott and Ian arrived at 4.30pm which had us wondering whether they would have sufficient light left in the day to get all their measurements. It was quickly apparent they are a well organised and efficient team who anticipate each others actions and needs. They started on the cratch cover template thinking the wind (there were strong gusts) would prevent them from measuring the wigwam for wimps pram cover. Templates were made made for each side of the cratch followed by the roof. The sides will have zip openings and a window with a cover for privacy. The front will be secured to the cratch board with strong stud and dome fittings and the rear with elastic straps. Whilst Ian finished the cratch measurements Scott made a start on the pram cover by bending the sections of aluminium frame using a template. The aluminium tubing was then run through a pipe bender to create an arch in the roof section of each piece. The frames were then fitted to the handrails in the cockpit. As you can see they ran out of light and used the headlights of their van to complete the task of making the templates. Jan has chosen the colour for the material. It will be burgundy (dark crimson)! Scott & Ian finished after 6.30 and headed home in the dark. They informed us the cratch and pram covers should be ready by next Friday. Nick has almost finished the engine compartment. The fuel system is complete along with the cooling system and alternator connections. Nick filled the engine with 10 litres of oil (drained by Beta for transit). He did some final checks and then started it for the first time. The thing that was most apparent to me was the amount of power being generated by the Axiom propeller when the engine was only doing tick-over. Does this mean we will be yelled at to “Slow Down” when passing moored boaters? The temperature has dropped. You wouldn’t know it when you’re inside Waiouru except it’s sometimes possible to hear the Hurricane heater start up. The wiring for the solar panels was completed today and the array is now providing a small amount of energy to the domestic battery bank. There would probably be more power if it was sunny instead of grey, drizzly and overcast! Using a small length of scrap aluminium right angle extrusion I’ve made eight leg. Each has a rubber door stop screwed on the base. The ‘legs’ have been bolted to the corners of the two 100w solar panels to lift the panels clear of the roof. The panels will be positioned inline and horizontal at this time. Hopefully we will be able to find the additional funds at some future date which will enable me to make a tilt/swivel mounting. The next task was to fit the M4 solar plugs to the ends of the cables that have been run from the solar controller through the ceiling of Waiouru to the entry box on the roof. Special care was taken to ensure I crimped the correct solar connector to the right cable. Getting positive and negative reversed would be embarrassing! The price of panels has been steadily falling for the past six months but we wouldn’t want some light fingered person to walk off with then so I purchase two bike security extension cables from Halfords. 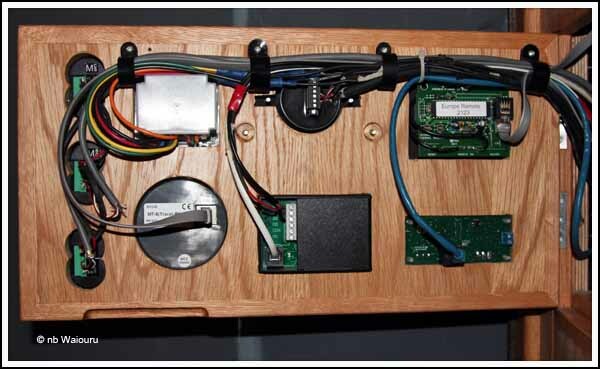 One has been run through the mushroom vent located between the panels and the looped ends of the cable have been padlocked to each panel. The cables will get tidied up when the roof isn’t so wet and slippery. 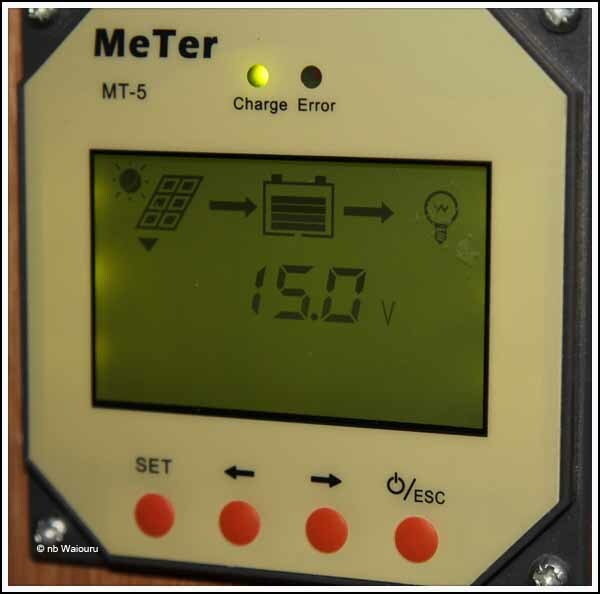 I was somewhat concerned to see there was no power at the Tracer MPPT solar controller. However after reading the manual (which I should have done first… it’s a man thing!) I realised the controller required a minimum of 8 volts from the battery before it would activate. This was solved by diving into the engine compartment and inserting a 30A fuse into the solar cable fuse holder <spark – crack>. Obviously there was now power in the circuit! The remote panel for the Tracer controller came to life and I was able to program it. 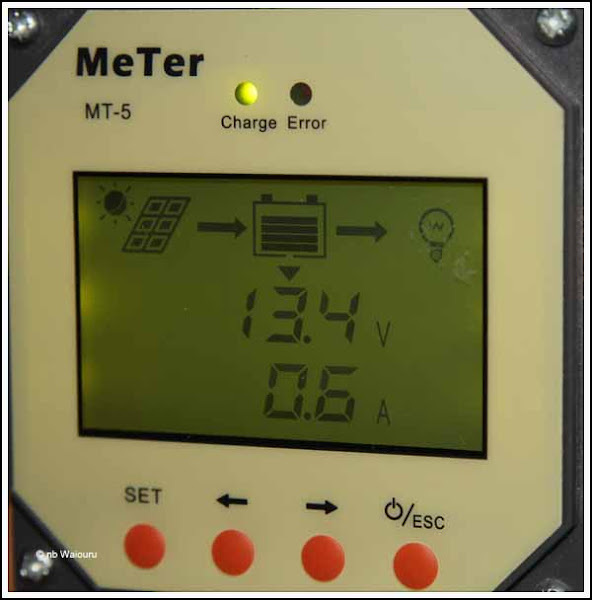 The domestic battery bank is delivering 13.4 volts and using 0.6 amps. As the domestic bank is already fully charged and Waiouru is on shore power, it’s unlikely the solar panels will contribute much in the way of energy at this time. The second plastic coated steel security cable has been threaded through the 3 Fold ladder and secured to the roof with a 3rd padlock. None of this will deter a determined thief! We’re still looking for some 2mm aluminium checker plate for our folding gang plank. There is some on Ebay I’m watching. Nick was on his own today but was fortunately able to spend almost all of his time working in the engine bay. Rather than disturb him I decided it was time to make a start sorting out the birds nest of wires in the stern electrical cabinet. When I started the wiring the area was rather tidy. However as a result of more cables have been fed into the area, and the need to get some components working so we can live on board during the build, it had become quite a mess! It’s one of those jobs where you ‘chase your own tail’ untangling wires and attempting to impose some neatness. It’s now partially completed. Fighting all these cables was exhausting for an “old fella” and by noon my stomach was asking my throat if it had been cut. Jan had disappeared telling me she was catching the bus to Calcot for essential supplies. Scrounging around in her pantry I found some bread which was slightly stale but then when you’re hungry you only look to see if there are any green specks on it! It was quickly wolfed down and I’d just started into a apple when Jan appeared. I was advised in no uncertain terms she had informed me before leaving that she would be buying bread at the shops and I should have waited. Apparently the poor bloody ducks are going hungry tonight as I’ve eaten their dinner! Richard and James have been sorting out a number of small joinery jobs. The bathroom doors are almost complete. Richard has decided on a method of securing the toilet door in the open position. It will require one of the light switches to be moved but that isn’t a big issue. 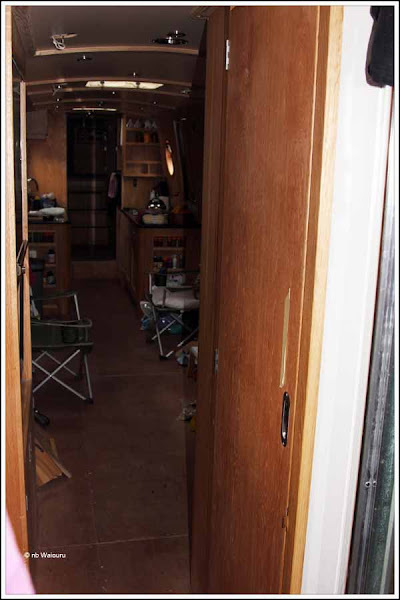 This is the view from within the bathroom looking to the stern with the toilet door closed. Same location but with the toilet door open. Nick has wired the engine compartment bilge pump whilst I made the connections to the Empirbus node. The pump is automatic (float switch) but also has a manual over-ride. The automatic part of the wiring wasn’t an issue s there was an allocated connection on the node. 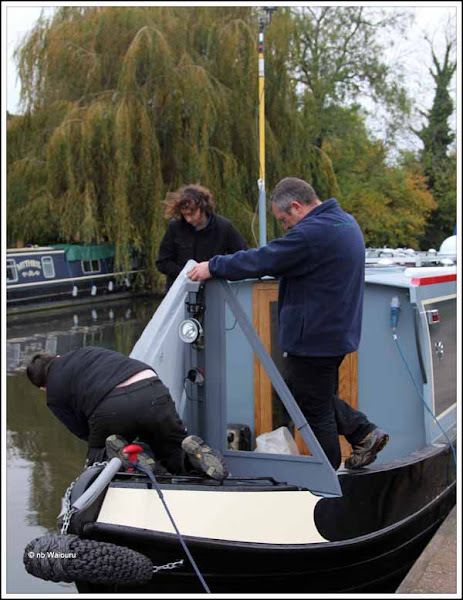 However there wasn’t a spare switch at the stern for the manual over-ride. 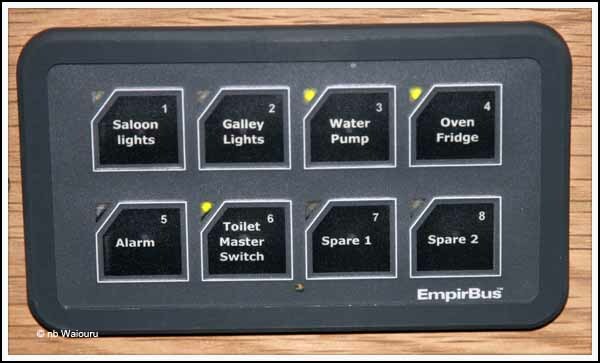 After Nick and I had discussed a number of options he said “Why don’t you use the same over-ride switch that is configured for the bow bilge pump?” This was an excellent suggestion (I only wrote the last sentence because Nick told me he is going to read tonight’s post!). 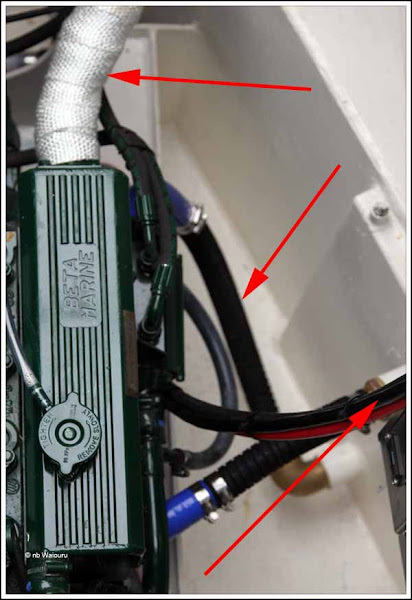 I reconfigured the Empirbus system so the manual over-ride switch for the bow bilge pump also activates the stern bilge pump. 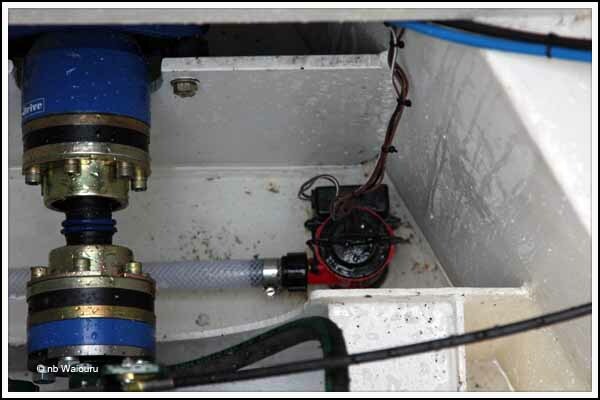 Nick poured water into the engine compartment to confirm the stern bilge pump operated correctly. Whilst he was away getting the wet-vac to remove the residual water I took a quick photo. Jan came walking back from the office with a couple of packages and I asked “Has the mail arrived?”. To which she replied “It’s called Post in the UK!” We were expecting a small package containing 8 rubber door stops I ordered for the solar panels. However Jan also had a large brown package. We were very pleasantly surprised to find the parcel had been sent by blog readers Marian & Mike of nb Duxllandyn. 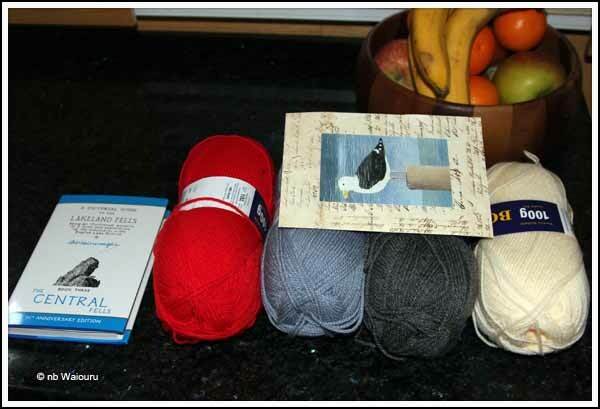 Marian has very kindly sent Jan some wool and even gone to the effort of selecting it in Waiouru’s colours. Knowing I enjoy walks in the countryside she also included a book on the Lake District Central Fells. Now I really enjoy walking in the Lake District and each time we have visited the UK we’ve always made time to spend a couple of nights there so I can walk. It was a lovely gesture Marian and Mike which we really appreciate. Marian, I hope you followed the link to the knitted blankets in this recent post as it provides very clear instructions on the technique. We’re looking forward to meeting you both somewhere out on the cut. You would think the reception on the TV would be better after all the aerials fitted to Waiouru. However, to my disappointment today’s picture was all bubbly and washed out. Then I realised it was mid afternoon and I was probably watching the soapies! Sometimes my eyesight isn’t that great and In the end Jan pointed out my error! 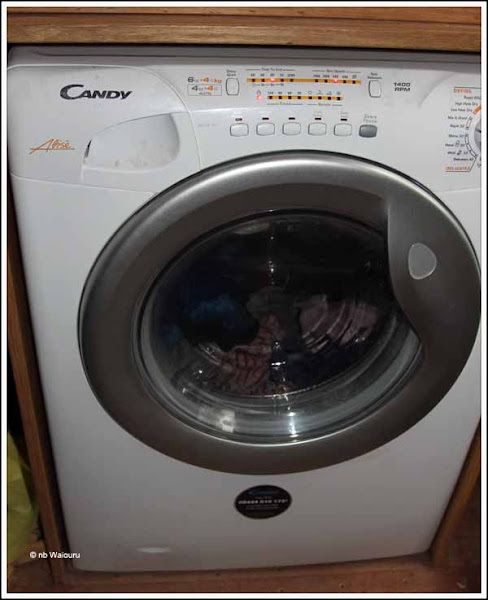 <humour mode off> The real purpose for running the Candy washer/dryer came about as a result of a conversation with Nick who had informed us some washing machines wouldn’t work with the power supplied by an inverter. So today we disconnected the shore power and ran the machine using the domestic battery bank via the Victron inverter. We had been told the “critical” cycle would probably be the drying. Well the Candy worked perfectly and there was no problem with the drying cycle. 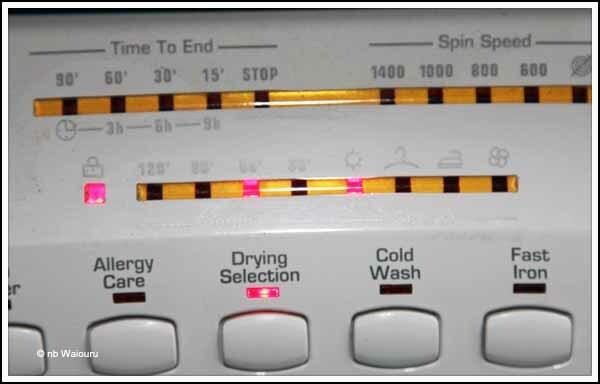 According to the SmartGauge the battery bank was at 100% before we started and was at 73% when one full wash/dry cycle had been completed. Obviously it wouldn’t be a good practice to simply use the power from the domestic bank to run the machine. 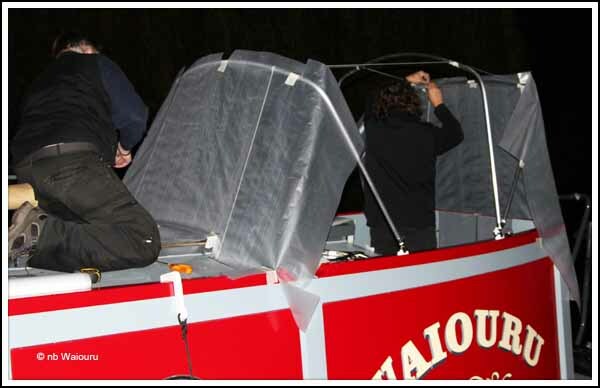 Like most boaters, we will run the washer/dryer when cruising so the engine alternators can supplement the batteries. 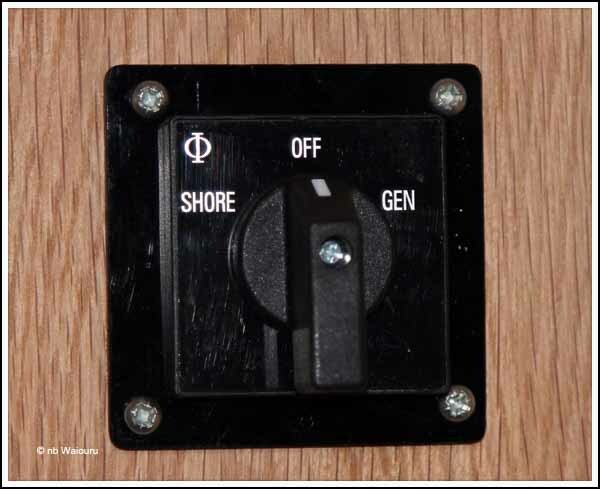 Whilst writing about electricity I’ll mention the shore power switch which I fitted today. 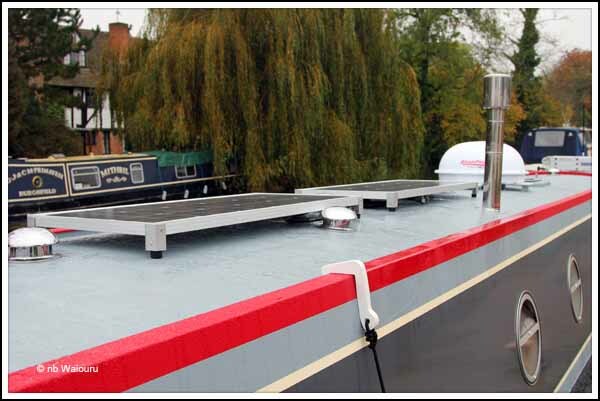 We have a shore power input socket in both the stern and bow which provides greater flexibility. Good safety means only one of the input sockets should be live. 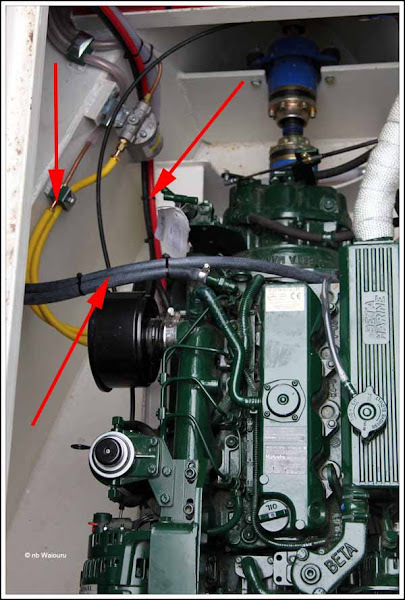 (ie, if the shore power is plugged into the stern then the bow socket needs to be isolated). To achieve this a two way switch has been fitted on the electrical cabinet. 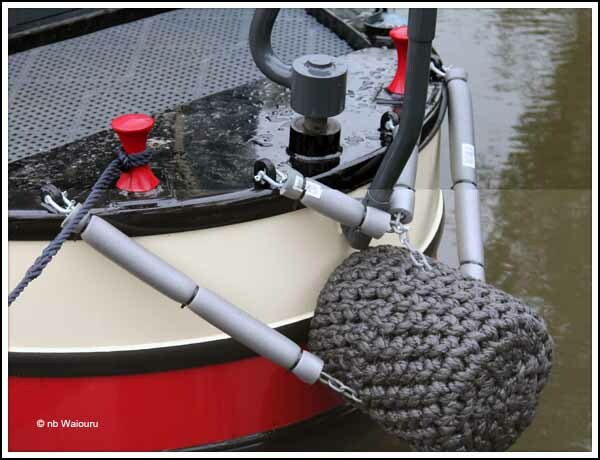 The switch will have to be relabelled Stern – Off – Bow. Somehow I suspect as planned continuous cruisers the switch will mostly be set on OFF! Late in the afternoon Andy appeared with a set of printed labels for the Empirbus membrane 8 switch panels. The switches were removed from the wall and the strips of labels were carefully cut and slipped behind the faceplate. I had to be very careful doing this as the labels are printed on overhead transparency sheets which are very thin and flexible. After some trial and error they all slid into place and the switches could then be fixed back on the wall. Richard and James hung the bathroom doors (again… this time permanently) and went on to fit more oak trim around the base of the partitions. This will prevent the partitions moving, but also enabled them to be removed at some future date should that prove necessary. Meanwhile, Darren applied an undercoat to the cratch board. He and Jan discussed colours and agreed the board would be painted graphite. Andy also mentioned the pram and cratch cover supplier would be visiting early next week to make up templates. He indicated manufacture would probably take three weeks. Nick is back tomorrow which will hopefully mean he will be working on the completion of the engine bay. Nick, Richard and James were all working on Waiouru. Nick’s first task was to check the Hurricane central heating as the front starboard (right) heating circuit didn’t appear to be getting much heat despite me ‘bleeding’ the front pipe radiator and the bathroom radiator. Eventually he bled the rear pipe radiator and then slightly crushed the copper pipe to restrict the flow of water. This appears to have forced more hot water through the bow portion of the circuit. The Hurricane heater has been running much of the day as Nick wants to remove any air from the system. After fixing the central heating he went on to run the alternator electrical cables in the engine compartment. These have now been completed with cabling from the 50A alternator to the starter motor battery and more cables from the 175A alternator to the domestic battery bank. 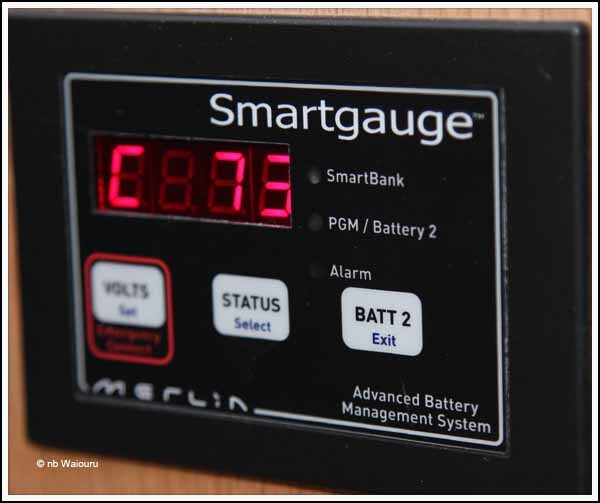 The output of the two alternators can be combined using the SmartBank charging system. He also assisted me calibrate the diesel gauge for the engine tank. The Hurricane heater tank calibration will have to wait as the tank has to be full for accurate calibration. 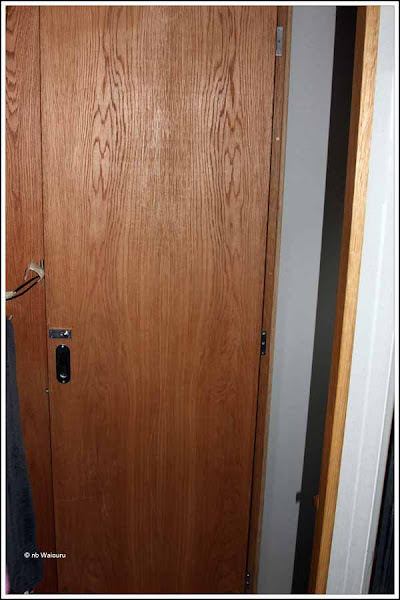 Richard has been hanging doors and during that process he had an idea that we could eliminate one door by combining the functions of the toilet and bathroom doors. The proposal is that the toilet door would normally be closed for privacy when using the toilet but can also be fully opened to fill the gap in the corridor between the saloon and the bathroom. This would eliminate the need for a separate door between the bathroom and saloon. He then went on to hang the door at the opposite end of the bathroom. In the open position it conceals most of the shower cubical. Left arrow – combined toilet/bathroom door. Right arrow bathroom/bedroom door. Meanwhile James has been working on the timber liners for the rear doors; the King Plank; and the side hatch door liners. Mid afternoon I managed to drill a 7.5mm hole through the forward edge of the steel mounting that forms part of the rear sliding hatch. 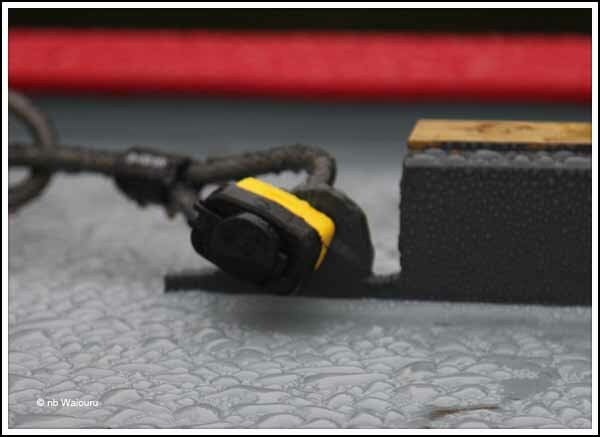 The plan is to make this a security point (padlock) for the plastic coated steel cable that will go around our aluminium gangplank. Hopefully this will deter all but the most determined individuals from walking off with the gangplank. Jan and I had a long discussion regarding the oven. It hasn’t worked properly since being installed and the gas engineer has visited three times and not been able to get it working. She has lost faith in the model and we are now looking at alternatives. With some “jiggling around” we can probably fit a slightly bigger oven into the compartment. It will mean losing the shelf and storage area immediately above the existing oven, however Jan is prepared to accept that if it means she gets a larger oven. My concern has been the effect that the ‘tumblehome’ of the boat will have in restricting the size of the replacement oven. But it looks like we may have overcome that potential problem. Andy was going to contact the cratch cover manufacturer and arrange for them to come and make a template. So we are still forging ahead! It’s once again time to renew Waiouru’s insurance. This is the third time we’ve had to do the annual renewal but Waiouru has been in the water less than a week! Work that out????? 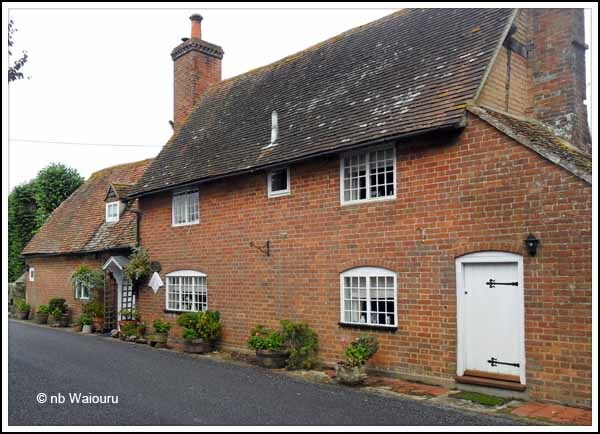 We are again renewing with Towergate Mardon and remain very satisfied with their level of service. The payment can be made by phone and we will also change the method of contact from post to email as we will shortly (optimism mode on) be continuously cruising and not have a postal address. Being Sunday the morning started with a telephone call back to Perth, WA for my weekly chat with my mother. Then it was time for breakfast (healthy porridge) before donning the walking kit and heading off on a 21km circuit to the North of Aldermaston Wharf. A grey day and very damp underfoot. It’s now apparent that avoiding Bridal Paths in spring and autumn is a good strategy as they tend to be very cut up and muddy after all the equine traffic. Pheasants must be out of season because they are both numerous and very cheeky. 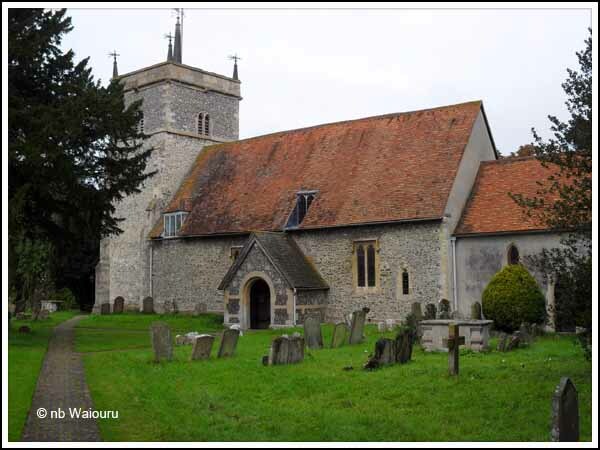 Much of the walk was over old ground but at one stage I exited from a footpath to discover a quaint roadside property and one of those quintessential rural English churches that seem to be very prolific around the area. The home is hard against the road with very little room on the opposite side. One assumes it dates back to a time when the traffic consisted of horse and dray. This plaque was mounted on the wall. More than 100 years prior to England annexing New Zealand. Behind it was the local church. A service was underway and I counted about a dozen cars parked outside. It must be hard to keep the church operating with such a small congregation? Back at the boat it was time for a necessary shower to warm up followed by a late lunch. Then it was off to the workshop to give all the cratch timber components a second coat of ‘Impreg’ so Richard can continue tomorrow. 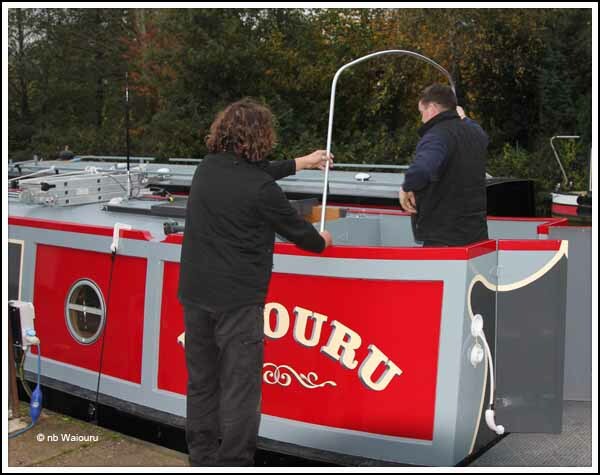 I’ve been wanting to cover the bow and stern fender chains to protect the paintwork and had purchased some foam insulation tubing at B&Q. Paul (local boater) informed me the foam will probably fall to pieces and he is likely to be right. However in the absence of being able to find anything better I fitted it to the stern fender this afternoon and secured it with cable ties. We will just have to keep our eyes open for something more suitable. Last task for the day was to fill the water tank. Tonight I must find time to read the instructions for calibrating the fuel gauges. The process requires a bicycle pump which we purchased from Halfords yesterday. Jan has a chicken in the slow cooker which has been going all day and filling Waiouru with delicious smells. No prize for guessing what’s for dinner!